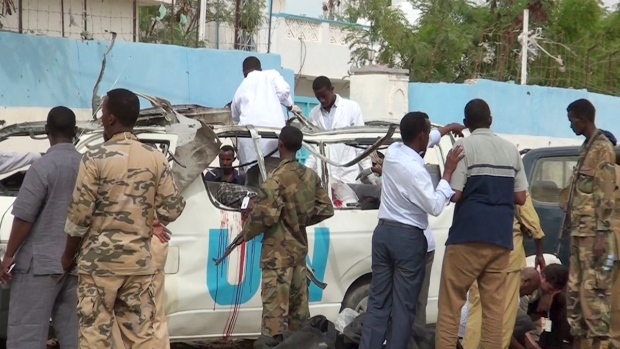 MOGADISHU, Somalia -- Islamic extremists set off a bomb in a UN van in normally tranquil northern Somalia on Monday, killing at least seven people, including four employees of the UN children's agency in an attack that was widely denounced. Two Kenyans, one Ugandan, one Afghan and three Somalis died in the explosion in Garowe town and one American, one Sierra Leonean, one Ugandan, one Kenyan and four Somalis were wounded, police Col. Ali Salad told The Associated Press. "This attack is not just targeted at the United Nations, but in attacking UNICEF, al-Shabab has also attacked Somali children. It is an attack against the future of our country and I condemn it in the strongest possible terms," Mohamud said in a statement. Al-Shabab, which is battling to convert Somalia into a hard-line Islamic state, claimed responsibility through its radio station for the attack in Garowe, capital of Puntland state. UNICEF Executive Director Anthony Lake said: "Our colleagues dedicated their lives to working for the children of Somalia. They are not victims. They and those who were wounded are heroes. We mourn their loss and hope for the full recovery of the injured." Garowe resident Jama Hashi said he heard a thunderous blast inside the van, which he said was passing near the offices of the UN's food agency when the bomb went off. Human limbs were scattered around the scene, he said. Security forces sealed off the area as ambulances carried the wounded away. Photos showed the roof had apparently been blown off. A corpse leaned out of a window whose glass had been blown away, dripping blood onto the side of the van. "It's a dark day, but terrorists must know that the blood they shed will not go in vain. We shall deal with them with an iron hand," said Salad, the police commander in the semi-autonomous Puntland state. UN Secretary-General Ban Ki-moon said at UN headquarters in New York that "the men and women who bring humanitarian action to light are an inspiration to us all." "Targeting such brave and dedicated individuals for violence is an attack on us all," he said. "We must do our utmost to bring the perpetrators to justice and to ensure that humanitarian personnel have the security they need to carry out their vital role." 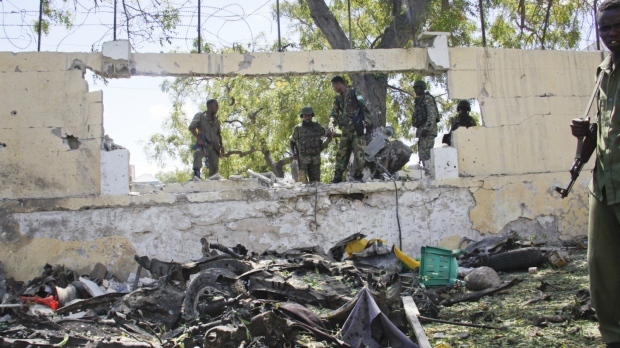 Bombings are rare in northern Somalia, unlike in the south where al-Shabab is battling the Somali government and the African Union forces bolstering it. Al-Shabab claimed responsibility for an attack earlier this month at a college in northeastern Kenya in which at least 148 people, most of them students, were killed. Kenya has sent troops into Somalia as part of the AU force to stabilize the government and attack al-Shabab, which is allied with al Qaeda. 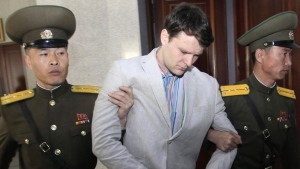 AP reporter Edith M. Lederer at the United Nations contributed to this report.